The Glenn Beck Review: Is Glenn Beck a cult of personality? Anyone, who has had any interactions with Beck's loyal followers, may immediately answer the question of the post title in the affirmative. 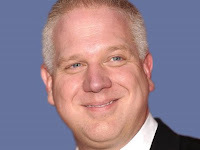 Yes, Glenn Beck may well be a cult of personality; but has Beck used his Fox stage to become thus? If so, how would we know? If not, then what better describes the cult-like following of devoted and adoring supporters? ...arises when an individual uses mass media, propaganda, or other methods, to create an idealized and heroic public image, often through unquestioning flattery and praise. Cults of personality are usually associated with dictatorships. The sociologist Max Weber developed a tripartite classification of authority; the cult of personality holds parallels with what Weber defined as 'charismatic authority'. Although Beck holds no office and has no power, he does wield significant influence over millions of Americans. The mechanisms that Beck uses to sway people to his way of thinking include, most significantly, manipulation of his viewers. It has been argued here that Glenn Beck is an ignorant genius of reactionary, yellow propaganda, and it is that "genius," along with the highly effective manipulation that he employs, that generates not just a following, but people wholly CONvinced that Glenn Beck is honest, principled and an important figure on a mission to restore American back to what the Founding Fathers intended even if the facts prove that Beck is a liar, a hypocrite, a fraud and a highly effective propagandist telling people what they want to hear thereby reinforcing their feelings, beliefs and faith. Is Beck really a cult of personality? 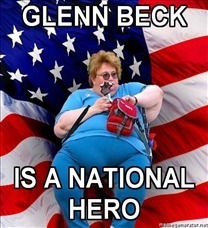 That is not a matter of understanding Glenn Beck so much as it is a matter of understanding his cult-like followers. There are many examples of their comments that can be offered to support the argument that Beck has a flock of followers who are fanatic, intensely loyal and full of gushing praise; but there are two sites that demonstrate the intense and protective loyalty on one hand and the sheer ignorance and gullibility of his fans on the other. Together these seem to show that if Glenn Beck is not yet a full-blown cult of personality, then he is well on his way toward becoming something that transcends a radio and television blowhard of any ideological orientation. The latter two comments are by two troopers (character assassins) who have been exposed previously on this Review. The anonymous (cowardly) and racist (once referred to Obama as "your boy") "Benny_Hill" does not even pretend to be much more than a character assassin. His idea of "winning" with relentless attacks on the blogger involve referring to a man as "Vicky." The "ladies who argue like reasonable adults" also refer to a man as "Vicky." That's reasonable? Momwith5kids' claim of "destructive narcissism" is particularly stupid since no diagnosis like that is possible without a face-to-face interview. It is all about assassinating the character and deceitfully rendering legitimate and honest criticism of their hero as disreputable. Todd, to his credit, is the ONLY ONE there who even attempted to address the charge that Beck is a hypocrite for embracing Rand's atheistic philosophy. 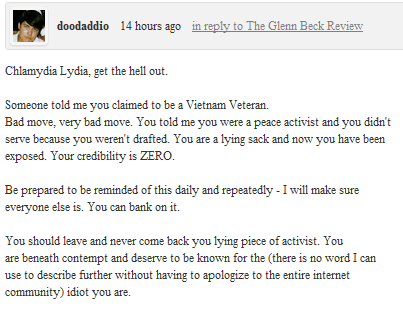 Clearly, Todd doesn't grasp the point of the accusation against Beck. The attack dogs there believe that this blogger is "ignorant," but they don't have the maturity to defend their hero like an adult! If you click to that page and spend time reading more of the hundreds of comments attacking this Reviewer, (listed as "Guest" there), you'll note that Todd is trying to make the case that a statement made in error (unintentional false claim), insults and opinions even are the same as a lie (intentional false claim). He repeats this claim even though the matter of intention, admission of error and correction makes all the difference to credibility. He doesn't care about actual facts; undermining Beck's critic is his primary intention. Todd is also wrong about Rand's anti-Christian opinions. Unfortunately, someone at Beck's website banned further comment by The Glenn Beck Review to allow corrections of Todd's ongoing smear campaign. Bear that in mind if you encounter his baseless claims and distorted accusations. His minions are brutal and fundamentally -- like Beck -- dishonest with their attacks on this critic, not just there but wherever this blogger comments using the Disques system. Does an ad hoc team of deceitful character assassins support a conclusion that Glenn Beck is a cult of personality? If you are still not convinced that Beck is a cult of personality, then check out another blog, Wisdom from the Blaze. 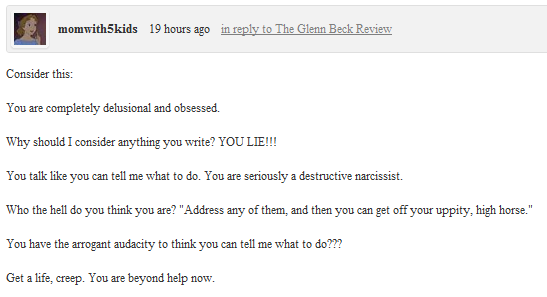 It documents many of the hateful and ignorant comments coming from subscribers to Beck's "news" site, The Blaze. This is just three of thousands that have been documented on that blog. "Obama-Mecca-Me-Sick" conveys the intense delusion of Beck's gullible supporters and the one thing that most if not all seem to have in common with Mr. Beck, a visceral hatred for President Obama. It is one thing to be a social conservative but another to adore a proven liar. It is one thing to be a reactionary (libertarian) and something else to embrace a hypocrite like Beck who undermines his principles whenever he thinks it sounds good to do so. So is Mr. Beck a cult of personality? Perhaps the answer is in the mind of the observer. Perhaps there is not enough information available to make a definitive claim one way or another. Maybe a better indication of the answer to this question comes not from thousands of exchanges with his devoted followers as seen on Glenn Beck dot com, but rather from the many comments on others pages of his site and on The Blaze from his adoring supporters addressing him directly. To be clear, there are critics addressing Beck on his site, but they are far outnumbered by the sycophants who adore him there. 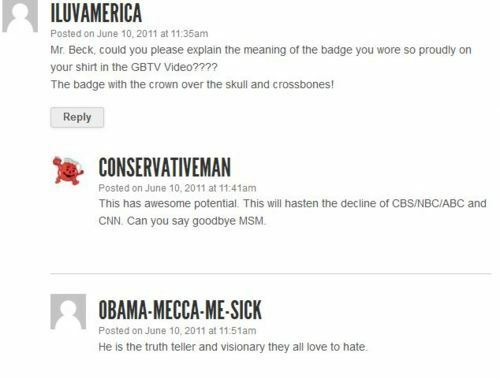 Update, 7/21/2011: Several sites are listed above that show the lunacy and irrational devotion Beck's devoted followers have for him, but none show the extreme hatred that his minions and attack dogs have for his critic like a story on Mediaite where they once again caught up with this blogger writing comments there as "Veritas Praetoriani." Once again, the smears and deceitful attacks on the character of Veritas sadly required another deletion of the comment name. Beckerhead Todd Scheller seems to have devoted himself to making sure that this blogger's character is assassinated whenever and where ever he can find links to this site. See: " 'Security Concerns' force Glenn Beck to move Israel rally." Note how they are so concerned about keeping people from finding out the truth about Beck that they falsely claim this Review is "buggy" and infected by a virus. There is, as Bia confided, no winning and no getting through to these Beckerheads. The prove me wrong about Rand here. Rand rejected ALL Religions, not Chirstianity specifically. I agree she rejected Religion (in all its forms). That does not mean that she was Anti-Christian, that means she was Anti-Religion. On Saturday you wrote "it is usually impossible to tell whether he is being ignorant, spouting misinformation because he does not have a clue, or if he knows the truth and is intentionally lying. No doubt, that is the reason that media critics prove that he makes "false claims" rather than he tells lies." So what does that say about these untruths from you. Good job getting yourself banned from TWO SITES in one week. Evidently I am not a follower of Beck's to me he is a misleading the gullible and using the ignorant to gain some God Like Figure, by dividing the Country with hate and lies, this is not good for those who follow Beck because once they see that he is not who they though he was there will be hurt and misunderstanding of their leader for now. Those who are misleading the Flock the cover is being pull off of them no longer will they be able to hide behind words. Todd, when you admit to lying about me, purposely trying to smear my good name, and apologize for it, I will do your homework for you. It is not surprising that it took Beck so long to realize how anti-Christian she was. I do not offer "untruths" Todd. Like every other person in the world, I have made a couple of errors. I acknowledged them, but you kept insisting that they were lies which makes you, Todd, either too stupid for words or just a sleazy character assassin. Of course, anyone who devotes himself to attacking a critic of someone like Beck, a cult of personality, liar, hypocrite and propagandist, must be pretty stupid. You want to defend a reactionary Todd, defend Ron Paul. At least he's honest and principled. I was banned from Glenn Beck dot com for pointing out that he is a coward for not debating Van Jones and is in no position to "restore courage" because of his fear. Actually, I'm surprised that it took that long since I have been pointing out what a liar, hypocrite and yellow propagandist Beck is for months. The rhetorical question begs to be asked: why can't you see what a liar and hypocrite Glenn Beck is? "My Thoughts on different subjects," I hope you're right,but what I've found is that it doesn't matter that the cover has been pulled off. I battled for months on Glenn Beck dot com, and even his more highly educated supporters could not even begin to grasp Beck's deceitful manner of communicating. I don't think that they are open to the truth about Beck. This Review is more for those looking for information about Mr. Beck rather than those who are a part of his cult of personality. They are lost to objective reality. Luckily, they are few in numbers.